0 Comments Published by Terrace Crawford on 8/31/09 at 8:38 PM. Thursday evening I was in Richmond, VA for the Glorious Unseen concert. Got to meet the band and have dinner with them. On Friday evening I was in MD at FED EX field for the Redskins game. Enjoyed lots of VIP treatment. It was awesome. Rode around downtown Washington around 1am. It was fun. Didn't get home till 6am Saturday. I'm still wearing my VIP wristband. Several people have asked why I'm still wearing it. My response is - "I want to treasure the VIP memory for a few days." Ha. Preparing to speak in our weekend services this weekend. I'm stoked over the message. I'd appreciate your prayers. Invite a friend & join us! Have some family visiting this weekend too. I can't wait to see them. Threw a disco party for students on Sunday evening. We had a blast! Was supposed to have lunch today with a good friend. He had to cancel due to flooding at his home. :=( Always enjoy our meet-ups. [Vote] for your favorite tweeter! Finally updated my profile pic on Facebook. I have very little photos compared with a profile I ran across earlier that had over 950. Wowzers. Got a free DVD in the mail today from this guy along with a nice STORY poster. Really want to attend STORY. I hope it works out for me to go. Over 5,000 people have registered for The Nines. Have you? I'll be hosting The Nines right here on my blog on September 09. Some random lady handed me a mint earlier. Was she trying to give me a hint? This dude needs an intervention. Maybe I do too. I got a little hacked off at a telemarketer earlier. If not an intervention, sometimes I need someone to screen my calls for me. So long August. Hello September! Unfollowed a few people on twitter who have been complete jerks. Contemplating blocking a few on facebook too. I don't mind a healthy debate... but consistent rude or negative comments won't be tolerated on my turf. Secured an interview with a mainstream best-selling author! I cannot wait to interview him and share it with you here on the blog. Today was one of those days I gave serious thought to a media fast. 0 Comments Published by Terrace Crawford on at 3:44 PM. 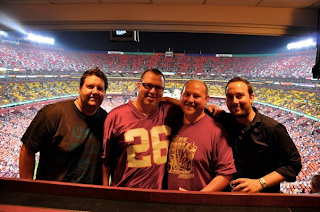 On Thursday my good friend scored VIP passes to the Redskins vs. Patriots game on Friday evening. He invited me to come along and boy did I enjoy myself. Let me just say, I can get use to the VIP treatment real quick. Parking at the entrance to the stadium, free buffet dinner in the loge and honestly, the best seats in the house. It was a night to remember. 4 Comments Published by Terrace Crawford on at 3:29 PM. If you have just finished up summer camp you are probably doing a bit of evaluating on the week's events. Chances are some pranks went down in your camp. Let me ask you a question: Are pranks on your list of things to "repeat" or on your list of things to "never repeat?" Most likely you will not have the word pranks on your list of things to repeat. Believe me, I use to be a mastermind behind pranks. I loved them. I have hilarious stories to tell. But I've changed my opinion of them after it finally showed up on my list of things to "never repeat." During one of my camp experiences with middle schoolers I will never forget sitting in a corporate worship session observing a couple of kids who were emotionally hurt from a prank while others were obsessed with strategically planning their next move. Because of my tolerance for pranks (and sometimes subtle encouragement) I had driven teens to distraction. Some might argue that pranks create memories (and I use to be in that camp), but I've seen pranks more often than not (in a camp or retreat setting) be a real distraction from the spiritual takeaways that I so wanted for my students. I'll never wear the title "pastor of pranksters" and I'm okay with that. The job isn't rewarding enough. 0 Comments Published by Terrace Crawford on 8/29/09 at 10:56 AM. (1) I love Catalyst. (2) My good friend, Zak, is highlighted in the vid. (He's the guy with spikey hair who says "Catalyst is the best thing in the country.") (3) There's a snippet of one of my favorite bloggers, Steven Furtick, speaking. (4)Andy Stanley. 4 Comments Published by Terrace Crawford on 8/26/09 at 3:28 PM. In a recent blog post I mentioned that I read 20 blogs per day but I never mentioned which ones. I actually read about 25 blogs per day. I subscribe to the RSS for 20 of them, while others (approximately 5 different ones per day) I visit by direct URL. So who are your favorite reads? 0 Comments Published by Terrace Crawford on 8/24/09 at 8:12 PM. Had an awesome weekend with lots of opportunities to connect with people. We called it Share the Love weekend - complete with the biggest flea market our city has ever seen but everything was FREE. Wish you could have seen the line of people out the door on our main campus. On Sunday we shared some more love by serving a free luncheon. One of my favorites too - free Rita's Italian Ice for every attendee! It's so good I wish my mother would have invented it ... (by the way, her name is Rita too). Got a very encouraging txt message earlier from a pastor-friend. He says "thinkin of u. i pray God hits u in the face with his grace today." I loved it. and need it too. I've gotten some very cool letters and txts lately. Thanks for your encouragement. Is it just me or are there more horror movie previews than ever before? Watched the Veggie Tales with students on Sunday. It was an experience. They LOVED it... and so did I. Been ages since I've seen the talking veggies. Have you entered my current promotion? I'm giving away 4 FREE REGISTRATIONS to LifeWay's National Youth Worker Conference. Read this post today - 10 Keys to Leading Creative People. Good stuff! [This] is incredible. The Forum - A free 2 Day Event. Found a little MJ station online. Checked out the vids. Spoke with someone on the phone today who was obviously reading from a script. They paused for 10 seconds after each and every line. It was weird. Over 3,100 people have registered for The Nines. Have you? I'll be hosting The Nines right here on my blog on September 09. Holy smokes. Elevation saw 500 people come to Christ on Sunday! Just read some sad news from Jeremy Camp. Please pray for he and Adrienne. I got to work with Jeremy a few times when I was in radio. He is such an incredible guy. Watching a little of the Colbert Report before bed. 1 Comments Published by Terrace Crawford on at 6:00 AM. Make sure to check out the site, register, and join me and countless other youth workers for the time of your life. 2 Comments Published by Terrace Crawford on 8/21/09 at 9:19 PM. James Cameron directed a film 12 years ago. It was called Titanic. He hasn't directed anything since. Until now. And his new creation is being dubbed the "future of film." Here is a sneak peak at the new film, set to release in December, called "Avatar." RSS Subscribers: There is video [here]. 1 Comments Published by Terrace Crawford on at 1:49 PM. I just mailed out some more FREE resources for leaders. In fact, I do this weekly now. I spent some time this week just calculating and have found that this year alone, 2009, I have given away more than $4,200 in FREE resources! I love resourcing, equipping and networking leaders and feel that this is part of my calling. In fact, I feel God is about to take this to a whole notha level. I'm not sure what this will look like, but I can tell you that more often now resources and opportunities to equip and encourage leaders are coming my way and I wouldn't be surprised if next year at this time that figure I just gave you triples in number! The reality is, everything isn't free. There is cost involved in being able to resource leaders. I don't want to have to curtail spending or cutback on the number of resources I'm able to provide; however, this site and ministry operates on donations and sponorships. If you have been blessed by this site in some way or would like to participate in being a blessing to others and would like to make a contribution, please utilize the donation link on the sidebar of my site. You can also mail a contribution to: TerraceCrawford.com, PO Box 2461, Yorktown, VA 23692. I'm doing something special for the first few contributions I receive after this post. The first 5 people to contribute $20.00 or more will receive a FREE CD & BOOK of choice from my warehouse! Thank you for your continued support of TerraceCrawford.com and please, tell others about this site. I'm excited about the future plans I have for this site. 56 Comments Published by Terrace Crawford on 8/20/09 at 1:17 PM. I'm giving away FOUR (count 'em 1, 2, 3, 4) FREE registrations to LifeWay's National Youth Worker's Conference that will be held in Nashville in September! LifeWay's National Youth Workers Conference is three days of inspiration, encouragement, and practical how-to's focused on developing students, a time for youth workers to come together and learn more about student ministry. [Click here] to see the full line-up of speakers and artists headlining the conference this year. If you can go and would like a chance at winning FREE registration to the conference (valued at $145.00! ), just leave a comment (with your full name and city & state where you reside) and you are entered! It's just that easy. *The promotion will begin immediately and will end at 3:00pm EST, August 27, 2009. *The prize is one FREE registration with a retail value of $145.00 USD (“Prize”). Hotel accomodations and airfare are not part of this promotion or prize. The winner is responsible for contacting the sponsor (Terrace Crawford) after promotion ends and winners are announced within 14 days to claim prize. *To enter the promotion, the entrant must leave a comment indicating their full name and city & state where they reside. *Four winners will be selected randomly from all the valid entries. Sponsor will post the winner's names to this post. If the winner does not respond within fourteen (14) days, he or she will forfeit the prize and another winner will be randomly chosen. *No purchase is necessary to enter or win. Void where prohibited or restricted by law. Employees of Sponsor and family members of such employees are not eligible to enter. By participating in this promotion, entrants agree to release and hold harmless sponsor(s) from any claim or cause of action arising out of participation in the promotion. We appreciate any tweeting about this promotion! Good luck to all who enter. 2 Comments Published by Terrace Crawford on at 6:54 AM. I'll never forget one of my good friends saying "creativity is not giving credit to the one who created it." Pretty funny... but so true. I've heard leaders who are upheld in the Christian community as "the most innovative yadda yadda yadda" say that they aren't really all that innovative. My hunch is that they also know this is true, because many of them borrow ideas from other people too. I get my creative juices flowing best when I gather with other creative minds. In fact, I have organized a creative meeting today to do just that. I pray. Nothing super-spiritual about my prayer, but [here] is the prayer I pray "God, grant me creativity." I meet with a network of leaders in my area. This is typically a monthly meet-up but it is very beneficial to me. There is nothing like gathering around people in your field to share ideas with each other. If you aren't plugged into a network, do your best to find one. If you are in youth ministry, you might check with the National Network of Youth Ministries to see what networks might be meeting in your area. I read blogs. I have a number of blogs that I read daily. I read blogs authored by youth workers, lead pastors, church planters and artists, among others. Currently I read about 2o people. I sign up on mailing lists. I'm subscribed to a number of church mailing lists around the country. Yes, maybe even yours. I don't read through the emails too carefully (who has the time?) but glance over the headlines and graphics to see what grabs my attention. Occasionally I find an idea that I like and may visit the church or ministry website for further information. I watch the culture. I think you might agree with me that the culture is leading the church today. We need to change this but that is for another sermon and another blog post. You can learn a lot by reading magazines, listening to music and watching movies or television. The media moguls of our time spend a lot of money researching the culture so why not pay close attention to it? Sometimes I get ideas simply from watching the culture. Sometimes you just have to take an idea and tweak it. Set the idea in a new direction. Put the idea through the gauntlet of taste... and wha-la, a new package for all to unwrap. 1 Comments Published by Terrace Crawford on 8/19/09 at 6:46 AM. 0 Comments Published by Terrace Crawford on 8/18/09 at 12:50 PM. TerraceCrawford.com has been selected as one of about 12 sites that will host THE NINES. It is specifically FOR church leaders (although anyone can attend). You will hear from dozens of leaders (nearly 60+ speakers confirmed already!). But get this...each one will only talk for 9 minutes. That's it. They will bring one big idea to the table and deliver it right to you in just 9 minutes flat. You don't have to travel anywhere to participate. Gather as a staff in a conference room or sit at home in your pajamas. Your choice. You can watch it all day (recommended! ), or you can come and go, tune in and out as your schedule allows. It is totally FREE. You do have to register, but there is no cost and there are no strings attached! I'm one of 1,500 participants that have already signed up to tune in. Please don't pass up this incredible opportunity. So sign up today, then tune in [here] on September 9th at 9:09am (CDT). Special thanks to my good friends at The Leadership Network and Catalyst for sponsoring such an incredible event... and for making it free. 0 Comments Published by Terrace Crawford on 8/17/09 at 8:46 PM. Went to a great one-day conference on Saturday and attended 3 seminars for communicators. Had a great Sunday. We began a new series called "FAQs," which will really help orient people fairly new to our church with our mission and vision. Chuck really hit a home run Sunday with a message about our vision and purpose. This summer has been so nice. Besides the rain, we've had incredible weather. Put together a running list of my favorite things that I plan to share with you here this week. Teenagers never cease to amaze me. I think that is one reason I like youth ministry so much. There is never a dull moment. We had a messy games theme party for students on Sunday evening. It was fun... and I got completely covered in flour. I looked like a powdered something another. I just had to take a Jesus pill... because someone about made me lose my Jesus a few moments ago. Seriously. Take a moment and go vote. I'll be here when you get back. Ever heard of a secret shopper for churches? My friend, Greg, just started this wonderful service. Watched a re-run of MadTV yesterday. I honestly thought that show was sometimes much, much funnier than SNL. Too bad the network canceled it. Good 14-season run though! Tomorrow will be a first for me... I've been asked to speak at a ladies' bible study. I'm not Beth Moore... but I will certainly try to bring it! It's coming this week. Did you miss the HUGE announcement? Last minute email check before bed. 2 Comments Published by Terrace Crawford on 8/14/09 at 11:24 AM. My phone rang this morning. It was actually a text I had received. "Have you heard the news about..." My first words were, "Oh no." More and more it's happening. Leaders are under fire. Don't get me wrong, everyone is really under fire... but the enemy goes after the leaders first. His plot is to take them down and cause a ripple effect. Two youth pastors that I know by name are facing prison charges this week. Both of them made very stupid mistakes. But I'm sure they weren't in the right frame of mind. The enemy makes you compromise one step at a time... and pretty soon you are like a fish that takes the hook - line - sinker. It's got to feel [to them] like they were completely blindsided. I'm sure that's the way those around them feel also. I'm very saddened (and discouraged) today by all of this and very burdened for those that are hurting as a result. I believe we are on a team here... and the team just suffered a big loss. Yes, I know who takes the victory in the end but it doesn't make this any easier. Be on your guard leaders. We are commanded to do this. ... and then I read it in [the Message] and got fired up. oh yes I did. "Keep a cool head. Stay alert. The devil is poised to pounce and would like nothing better than to catch you napping. Keep your guard up! You're not the only one plunged into these hard times. It's the same with Christians all over the world. So keep a firm grip on your faith. The suffering won't last forever. It won't be long before this generous God who has great plans for us in Christ - eternal and glorious plans they are! - will have you put together and on your feet for good. He gets the last word; yes, he does!" I needed that. I needed to reload. Scripture is the ammo. Stop napping! Make sure you reload! Keep your guard up! We are under fire!!! Wanna Go to the National Youth Worker's Conference? 4 Comments Published by Terrace Crawford on 8/12/09 at 11:49 AM. I was going to wait until next week to announce this but I'm too excited. Next week, right here on the blog, I am giving away FOUR (count 'em 1, 2, 3, 4) FREE registrations to LifeWay's National Youth Worker's Conference in September! [Click here] to see the full line-up of speakers and artists headlining the conference this year... and spread the word that right here, next week, we're giving away this goodness. Good Luck! 2 Comments Published by Terrace Crawford on 8/11/09 at 3:16 PM. 0 Comments Published by Terrace Crawford on 8/10/09 at 8:34 PM. Remember how I said last week that "sometimes on Sundays we get surprises when we enter the doors of the elementary school we meet in"? Yea, that happened again Sunday. Our team found a huge waterfall and lake in the back of the cafetorium that we had to deal with prior to setting up. Oh, and we had no air conditioning either. The silver lining around the dark cloud is that we were able to celebrate the new stage and brand new curtains we got to use. Youth Specialties has declared this Middle School Week! If you have a blog they encourage you to write at least one blog post about ministry to middle school students. We had a big Luau for students on Sunday evening. It was a blast! I'm conspiring with a friend to cook up something great in the world. Heard about MercyMe's recent accident involving their tour bus. Please say a prayer for them as its been a hard few days. Got a copy of Max Lucado's Fearless. Plan to start reading soon. Congrats to my good friends on the arrival of their first born! I'm planning to pitch an idea I have for a book to publishers sometime this week. Seriously. I've never written a book... but I plan to. At least I'm not in last place. I found myself dreaming about vacationing today. [Ha] That means it is soon time for one. 0 Comments Published by Terrace Crawford on at 1:05 PM. If you asked a parent of a teen in your youth group where their son or daughter spent time online they would probably guess Myspace or Facebook, but do they actually know what they do while using these mediums? 37% of teens said they used social networks to make fun of other students, but only 18% of parents believe their own angels do so. 13% of teens said they posted naked or semi-naked photos or videos of themselves. Only 2% of parents said their kids have done that. 24% of teens said they signed on to someone else's account without permission, while only 4% of parents said their kids have done that. 28% of teens posted personal information that they normally would not have revealed in public, but 16% of parents said their kids did that. [Click here] to download the full, executive report from Common Sense. Parents should learn about the networks their children are involved in by registering and exploring these mediums. Parents should talk to their teen about privacy settings and help them discern between whom to friend [and not friend] and what is appropriate to post. Parents should explain to their kids that stuff online is public [to an audience that is invisible] and can last... forever. Related: Gen Y'ers say their REAL friends are found online. I've been following the blog of Matt Logelin recently. I heard about him through an interview where he was telling of the adventures of being a single parent to daughter, Madeline. Matt experienced joy and sadness in 27 hours time when his daughter was born and then his wife passed away. 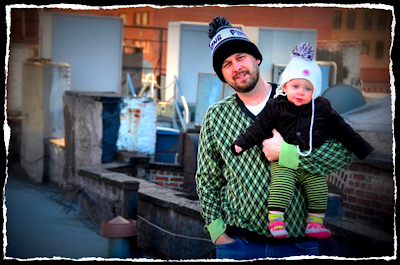 Matt started a blog soon after to share about daily life as a single parent. Word quickly spread and 40,000 subscribers [to his blog] later he has found himself on national television and his story published in People Magazine. I found this to be a very interesting and inspiring story about how he [Matt] has moved forward from such a painful experience to create something to help people. His blog is now a community for single parents, a place for giving and sharing advice, and he has created a foundation (named after his deceased wife) to assist families who find themselves in the heartbreaking situation of having lost a spouse or parent. 5 Comments Published by Terrace Crawford on 8/6/09 at 7:06 AM. This week Steven Furtick, lead pastor of Elevation Church in Charlotte challenged his staff to read the Bible in 90 days with him. They are calling it B90X. "B90x is a revolutionary system of intense, truth-absorbing, brain-busting Bible reading that will transform your understanding of Scripture from intro to nitro in just 90 days! Your personal trainer, Ruach "The Breath" Yahweh, will drag you through the most intense infusion of His vision that you have ever experienced and you won't believe the results!" Here is a little funny exchange I had with Steven (via Twitter) on the subject: his tweet ; my reply ; his response. Download a PDF of the reading plan that will be your guide. 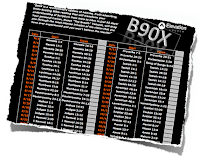 Also, make sure you twitter the #B90x hashtag (for accountability) each day as you complete the reading. That is, if you are on twitter. So are you IN? Bible in 90 days. 1 Comments Published by Terrace Crawford on 8/5/09 at 12:10 PM. On Monday I traveled to scope out a potential venue for our fall retreat and was listening to a radio station that was new for me. Pretty soon I heard this radio announcer state that she had hijacked the control room and put herself on the air in hopes that the station would give her a position. I was immediately skeptical thinking that this was some sort of a publicity stunt and decided to call in. I got the announcer [Kendall] on the phone and told her that she was doing a great job but there was no way she was an amateur. She quickly explained that she had worked in radio in Dallas and accidentally swore on the air one day and was let go. She moved to the Virginia Beach area and decided to apply to this radio station but was quickly denied because management felt she may be a liability. Soon after she visited the station [which happened to be this past Monday] to plead with the management to give her a shot and found the radio station empty. She decided to take a risk (and a big one I might add), lock herself in the control room and put herself on the air! Pretty soon she won over a couple of the staff who actually kept her from being arrested (and kept the police from using excessive force to break in) and 29 hours later (after she also won over the listeners -- who jammed the phone lines) she got the position she so desperately wanted. As of today, Kendall Taylor now runs the afternoon drive show (3-7 PM) and was glad she took a HUGE risk. By the way, I called to congratulate her after she made the announcement about the good news (while she was sobbing on-air) around 7:15pm last evening. Stories like this make me go "what in the world am I doing to take a RISK?" 32 Comments Published by Terrace Crawford on 8/4/09 at 12:13 PM. One of my favorite blogs to follow is authored by Josh Griffin, high school pastor at Saddleback Church. Josh and I connected nearly two years ago and I have appreciated his friendship ever since. Just the other day he sent me an email and asked if I heard about the release of his latest book, 99 Thoughts for Youth Workers. I got me a copy of the book and spent the weekend reading it. I must say that there are so many nuggets (not so much like Chickfila nuggets, but just as good - if not better) in this little book that you simply must read it. My friend, George Murray, said one time that his "best thoughts were written on white napkins." That is what this book reminded me of as I read it from cover to cover. Josh has captured his best thoughts and ideas from napkins, moleskins and blog posts and compiled them in this book. It's practical, its bite-sized and it's available now for only $4.99! I'm giving 2 free copies away right here... but if you don't manage to walk away with a copy from yours truly you can purchase one [here]. To enter this little contest simply leave your name and city\state (or territory) where you currently reside and do ministry in the comments field (of this post). I'll select 2 winners this Thursday, August 06th after 3PM, EST. 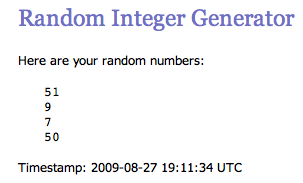 *Winner's names will be posted here on August 6th after 3PM, EST. Winners are responsible for emailing me with their full name and mailing address within 14 days after announcement is made to redeem their copies of the book. Picture Me... with Blue Hair. 1 Comments Published by Terrace Crawford on at 6:47 AM. I've never been real big into gimmicks or the 'bait and switch' methods in youth ministry but I'm considering it. This summer we've been building momentum for our fall launch but I'm interested in giving our kick-off a little more attention by doing something crazy. (Yes, I'm caffeinated right now). Some youth pastors have buzzed their hair, been tar and feathered or perhaps even eaten a live goldfish on the spot? (yea, I witnessed a youth pastor do that one -- and, for the record, I would never do that) to hype an event and get students to show up. While there are certain things I just won't do, nothing would thrill me more than to see students get more excited about our fall launch than I am. Bottom line: we want to see students come to Christ and we're laying the groundwork and creating an environment for that to happen. I'm interested in knowing what has been effective for you in creating hype over your series launch or ministry event? Have you done something crazy? Tell me your story. 0 Comments Published by Terrace Crawford on 8/3/09 at 6:22 PM. Josh & Co. was in town so we met up for coffee and had a great time. He then visited our church on Sunday. Sunday was a little crazy. Sometimes on Sundays we get surprises when we enter the doors of the elementary school we meet in. Our team has learned to be so flexible. They rocketh. This past Sunday we found that the school was doing some work on the stage & curtains so we had to set-up everything on the floor. I pushed to have 'church in the round' but made the suggestion too late in the game. That would have been super cool. Whew. What a Monday. Been busy since early morn working at the wheels. Spent the afternoon touring a facility for our potential fall retreat venue. My phone blew up today. I think I received more texts and more phone calls today than any other day. ever. Excited about the posts on my blog this week. Good stuff comin... stay tuned. This was my tweet to him. 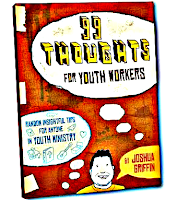 Reading this guy's latest book 99 Thoughts for Youth Workers. Just updated my itinerary. Excited about my upcoming opportunities, particularly where I get to network and enjoy some leadership development. Had an awesome time with students on Sunday at a big video gaming party we threw. Lots of new peeps! Very exciting. Spoke with a DJ today on the phone who hijacked the controls at a radio station and put herself on the air! She put me on the air too. :=) I plan to tell the whole story here this week. For some reason I'm incredibly sore today. One day I will make it to the pool. One day. 0 Comments Published by Terrace Crawford on 8/2/09 at 8:52 PM. Loved this David Crowder Band Rockumentary (on Twitter). Hilarious! and so true.